China's is overheating. Consumer prices in aggregate rose at an annual rate of 4.4% as of October. Food prices are up 10.1 percent according to China Financial Daily. Moreover, accelerating inflation is hurting profit margins in China's service sector. China's non-manufacturing PMI fell to a nine-month low in November, with new orders in consumer service industries showing outright contraction. In response to these inflationary price pressures, China declared a shift to a "prudent monetary policy", including price controls at Walmart. This begs the question: Since when do price controls constitute "prudent policy"? Price controls have never worked in history and this time will be no different. This is a pretty long post, but please stay tuned until the end for an analysis of Multiple Simultaneous Games of "Chicken". Topics include a comparison of monetary and credit growth in the US vs China, a look at the problems in Japan, a detailed look at various games of "chicken" central banks play with each other, and a detailed look at various games of chicken that speculators play with the market. To fill in the details however, we need to start from the top with a look at China's overheating manufacturing sector. China’s manufacturing grew at a faster pace for a fourth straight month in November, indicating the economy can withstand higher interest rates as price pressures escalate. The Purchasing Managers’ Index rose to 55.2 from 54.7 in October, China’s logistics federation said on its website today. Cement prices have climbed to a record, the state-run China Daily reported today. Consumer prices may have climbed 4.8 percent in November after October’s 4.4 percent gain, which was the biggest in 25 months, according to China International Capital Corp.
Spot prices of power-station coal at Qinhuangdao port, a Chinese benchmark, rose to a two-year high this week. The Irish Times reports the biggest increase in China's PMI came in the sub-index for input prices, which climbed to 73.5 from 69.9 a month earlier. Unable to pass on price hikes, China’s Services Industry Slows as Inflation Erodes Margins. China’s non-manufacturing purchasing managers’ index fell to a nine-month low in November as accelerating inflation eroded service companies’ margins. The index dropped to 53.2 from 60.5 in October, according to a statement today by the Beijing-based National Bureau of Statistics and the Federation of Logistics and Purchasing. A reading above 50 indicates an expansion. A separate service PMI released by HSBC Holdings Plc fell to 53.1, a near two-year low. “Inflationary pressure has started to show a negative impact on service expansion,” the logistics federation said in today’s statement. The non-manufacturing measure encompasses business and consumer services as well as construction and real estate. The non-manufacturing new-order index fell to 50.1 last month from 56.3 in October, and new orders in consumer service industries indicated a contraction, with a reading of 47, today’s data show. China will switch to a prudent monetary policy from a moderately loose stance, the Communist Party's top leaders decided on Friday, a change that could pave the way for more interest rate increases and lending controls. At the same time, the Politburo elected to maintain China's proactive fiscal policy, an indication that the government wants to continue to ramp up investment spending even while taking tightening steps to control inflation. "It means that all sorts of monetary policy tools to control liquidity and to control inflation can now be used," said Ken Peng, an economist with Citigroup in Beijing. "In the past we've been clearly focusing on administrative measures. Going forward we could be using more price adjustments via interest rates," he said, adding that he expected five rate increases by the end of next year. Would five rate hikes by the end of 2011 be enough? Since the answer is unknown, prudence would dictate for China to start hiking now in order to slow rampant credit expansion. Instead, Wal-Mart Among Companies Facing China Price Controls. The southwestern Chinese city of Kunming, where Wal-Mart Stores Inc. and Carrefour SA have operations, has imposed temporary price ceilings on daily necessities to counter inflation. Kunming’s government asked five retailers -- three non- Chinese, one Chinese and one based in Hong Kong -- to report any price adjustments and give reasons for the changes two days in advance of making any alterations, the National Development and Reform Commission’s local branch said on its website yesterday. Besides the five companies, other food, cooking-oil and beverage producers are requested to apply for government approval 10 working days before making price changes, the statement said. The city government also imposed temporary price ceilings on daily necessities in major parts of the city starting from yesterday to the end of February, according to the statement. Prices of grain, cooking oil, meat, eggs, milk and noodles are to be kept at levels before Nov. 17, the statement said. The city limited retail prices of vegetables, depending on type, to 40 percent to 100 percent higher than wholesale prices, the statement said. Not once in history have price controls ever accomplished anything good, unless you consider shortages a good thing. Expect shortages and black market pricing if the service sector and grocery stores cannot pass on input price increase. 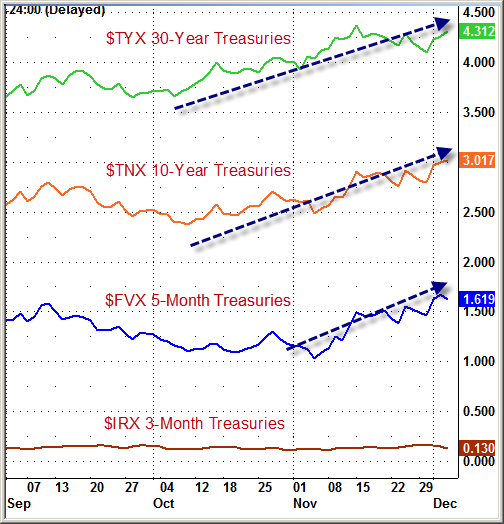 The market's response last Friday was swift and severe as noted by the following commodity charts. 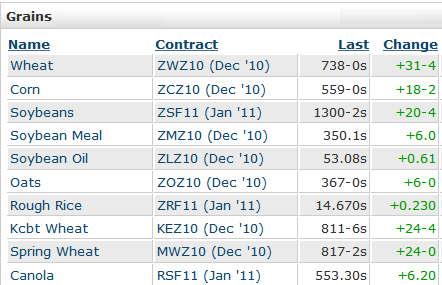 It's not chicken prices that are important but rather the very dangerous game of chicken that China is playing. 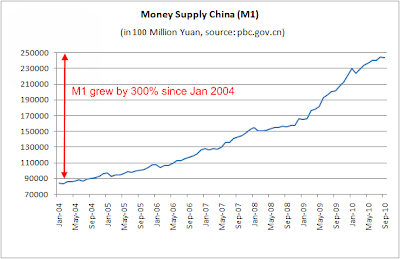 Money supply and credit are soaring in China and along with that explosion of credit is rampant inflation. 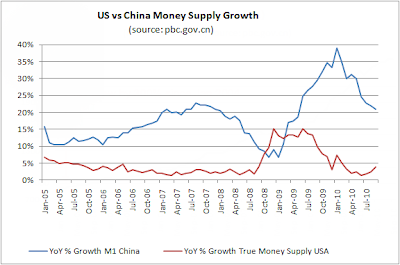 Economics Junkie has a nice set of charts comparing Money Supply in the US vs. China. According to the Fed Z1 Flow of Funds Report US domestic nonfinancial credit has been in contraction for 9 consecutive quarters, while domestic financial credit has been in contraction for 6 consecutive quarters. This means one or more of the following conditions are true, most likely all of them. Total debt is up 4.8% but only because of massive government spending (much of it completely wasted on futile stimulus measures). Moreover, the mark-to-market valuation of debt sitting on the balance sheets of banks is likely an absolute disaster. What cannot be paid back won't, and real estate loans are still extremely problematic. Unfortunately, we don't have an accurate assessment of just how bad things are from a mark-to-market perspective because the FASB has suspended rule changes and the Fed and FDIC purposely looks the other way on horrendous bank balance sheets for as long as they can. We do know the official problem bank list according to the 3rd Quarter 2010 Quarterly Banking Profile rose from 829 to 860. The unofficial total is 919. China's credit growth this year has not slowed materially from the rapid pace in 2009 despite headline data pointing to a slowdown, Fitch Ratings said in a report yesterday. The rating agency said that Chinese banks have been off-loading trillions of yuan in loans this year by artificially reducing their holdings of discounted bills and by re-packaging the loans into investment products for sale to investors. The report came on the same day that China said it would change to a "prudent" monetary policy in 2011 from a "relatively easing" stance. According to the report, the balance of Chinese banks' discounted bills was understated by as much as 1.65 trillion yuan (US$250 billion) at end of the third quarter. A discounted bill is an accepted draft against which a loan is made and the interest is deducted immediately. Through the action, bill holders can acquire cash before its maturity date at lower rate. It could be a channel for companies to get capital while bypassing the loan quota. Banks held more than 2.5 trillion yuan (US$375 billion) in credit not reflected in their balance sheets in wealth management products at the end of November. "Adjusting for these factors, the amount of new credit extended through the end of the third quarter was on par with the 9.3 trillion yuan extended in the same period a year ago," Chu said. "Credit conditions remain loose, which explains why inflation and property prices stay stubbornly high." US GDP is close to $15 trillion. This year's borrowing, including government deficit spending is roughly $1.7 trillion, or 11% of GDP. 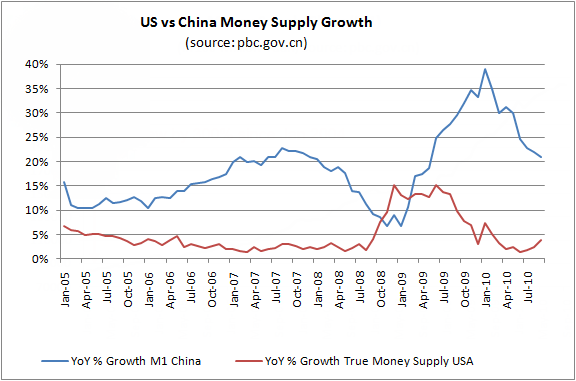 Money supply growth is 5%. In contrast, China's GDP is about $5 trillion with annual credit growth of 9.3 trillion Yuan (about $1.4 trillion), a whopping 28% of GDP. 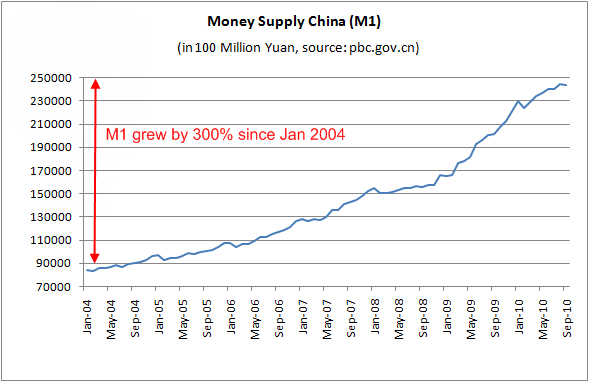 China's money supply growth has been over 20%, most of the time since 2007. According to The Telegraph "Property prices are 22 times disposable income in Beijing, and 18 times in Shenzen, compared to eight in Tokyo. The US bubble peaked at 6.4 and has since dropped 4.7. The price-to-rent ratio in China’s eastern cities has risen by over 200pc since 2004". Citing Fitch, The Telegraph reports "private credit in China has grown to 148pc of GDP, compared to a median of 41pc for emerging markets." Yes Virginia, there is rampant inflation, in China, not the US. Several misguided writers cite rising commodity prices and money supply growth in the US and warn of hyperinflation in the US by the end of 2011 or early 2012. They ignore the fact that inflation in China is the primary driver for commodity price hikes; they ignore currency debasement the world over; they ignore extremely important trends in consumer credit and bank lending; and they especially ignore consumer and business attitudes regarding debt and credit. That's one hell of a lot of things to ignore. Bear in mind that hyperinflation is a complete loss of faith in currency. Political, not monetary events kick off hyperinflation. Given that the US is one of the most politically stable countries in the world, with large gold reserves, with the world's strongest military, and with an increasingly conservative Congress, the idea that hyperinflation will hit the US anytime soon is preposterous. As noted above, China plays chicken with commodity prices, credit expansion, and price controls. That is not the only game of chicken. Internationally, there are multiple simultaneous games of chicken. For example, Bernanke plays chicken with China via a QE policy hoping to force China to jack up its interest rate, something China does not want to do. Bernanke plays a second game of chicken with Congress, treading on fiscal policy while demanding Congress not comment on monetary policy. Bernanke plays a third game of chicken attempting to spur inflation in the US while simultaneously holding down long-term interest rates. Can that possibly work? For how long? At what cost? The only thing that can save Europe is if senior bond holders take a haircut on debt owed by Greece, Ireland, Spain, and Portugal that cannot possibly be paid back. Instead of admitting the above, Trichet pulled out the "unlimited cash" bazooka. The problem with offering unlimited cash is that it is a high-interest loan that leaves the debt intact and puts a huge interest-rate penalty on top of it. Ireland cannot possibly pay back its debt even at 0% interest. Yet the EU and IMF expect Ireland to come up with interest at 5.8%, on a huge loan, when its budget deficit is 30% of GDP, and its economy is in contraction. Mathematically this Ponzi scheme cannot possibly work. The Reserve Bank of Australia played its own games of chicken, letting property bubbles get sky high in order to prevent a recession in 2008. Now, in spite of still rising commodity prices, Australia is on the brink of recession, with 3rd quarter GDP falling to .2%. Those plowing into Australian dollars in belief it is a safe haven just may have another thing coming when the Reserve Bank is forced to cut rates to combat a recession it refused to allow the last go around. Australia is finally poised to crash with massively rising housing inventory and multiple failed property auctions. The Australian economy will be in shambles when housing collapses. Imagine what happens when China slows and commodity prices sink as well. The Australian stock market could be in for one nasty spill. Canada has its own property bubble to reckon with, much the same as Australia. Indeed, most Canadian and Australian housing proponents are in their own Fantasyland bubble chanting "It can't happen here." In one of the biggest games of chicken the world has ever seen, Japan is hell-bent on defeating deflation. The result is staggering. Japanese government debt is 200% of GDP and growing, but inflation is nowhere to be found. Why is there no inflation in Japan? Because like the US, and unlike China, there is little to no credit expansion in Japan. This shows the importance of credit expansion as opposed to monetary expansion alone. Nearly everyone gets this wrong in spite of overwhelming evidence that rampant credit growth is the driver for inflation. Actually, to be far more accurate, net expansion of credit is inflation, not a driver of inflation. 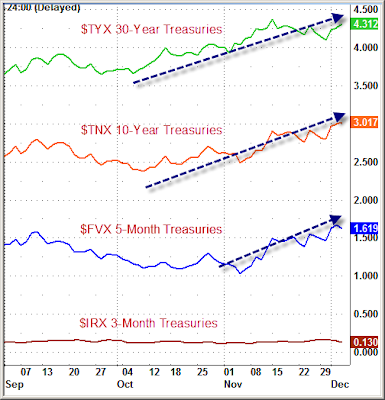 Are we "Trending Towards Deflation" or in It? In spite of ever-expanding national debt, Japan's long-term interest rates are the lowest in the world. Yet, because of demographics and a rapidly aging population, Japan will soon have to draw down on its "savings", all of which went into treasury bonds at 1%, all of it already spent, and 200% more, in various nonsensical deflation-fighting efforts. The problem for Japan is interest on the national debt will consume all revenues if Japan's long-term interest rates rise to a mere 3%. Yet, demographics show higher interest rates are nearly guaranteed unless Japan decides to default. The interesting thing about default is that countries frequently default on external debt but seldom default on debt owed to its own citizens. Nearly all of Japan's debt is internal. Will Japan default on that debt or will Japan attempt to print its way out? Should Japan try printing instead of defaulting, it faces a currency crash. If taken to extreme measures, Japan could conceivably see a complete loss of faith in the Yen (hyperinflation). At this juncture, hyperinflation is far more likely in Japan than the US. The critical question for Japan is "How long can this imbalance continue before it blows up in one direction or the other?" Interestingly, Japan may blowup both ways, first in one direction then the other, so the order and timing of bets is important. Interestingly, myopic, dollar-centric eyes remain focused on a US currency crash even though a Japanese Yen or Euro crash seems far more likely. However, the ultimate currency irony pertains to the Yuan, especially with Bernanke and Congress pleading for China to allow the Yuan to strengthen. Here is the reason: Hot money is flowing into China in speculation of rising interest rates, 10% perpetual growth, and a rising value of the Yuan. Few bother to think ahead as to what happens when that hot-money flow reverses or what happens if China cannot expand at the expected rate of growth for any reason. The kicker is that China cannot possibly grow at 10% perpetually and peak-oil is the reason. 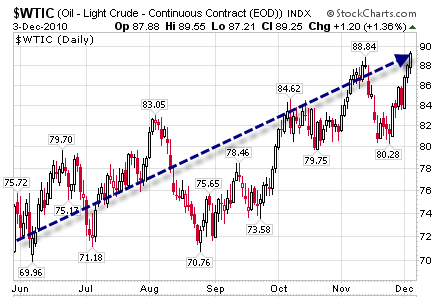 Peak-oil stares China-bulls straight in the face, but they are too blind to see it. Crude prices are soaring higher and higher, not only because of peak-oil but also because of the game of chicken Bernanke plays with QE and the game of chicken China plays with interest rates. In response, shipping and manufacturing costs rise, China overheats, and a price squeeze mounts on businesses unable to pass along all the input price hikes. Meanwhile, China-bulls (nearly everyone) cheer that which is unsustainable, and China itself thinks it can control prices with price-controls. As icing on the speculative cake, hedge funds, pension plans, and other speculators continually rollover ever-increasing numbers of futures and other derivatives which increases the risk for everyone. 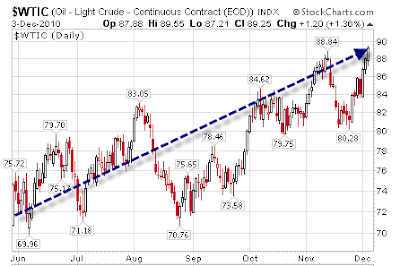 All things considered, it seems likely that such speculation, in conjunction with China finally hiking interest rates enough to matter, will cause a second crash in commodity prices (including crude) before peak-oil finally takes its toll. Bernanke and China together have acted in a manner that puts huge price pressures on the service sector, especially small businesses that cannot pass on prices. This will end, and it will not be pretty when it does end. Yet, hedge funds, pension plans, and other investors plow into commodities, currencies, and emerging market equities as if growth in China, Asia, and Australia and their currencies is a "sure-thing". Getting out in time is the key to success of hedge-fund and investing chicken, yet many do not even understand the nature of the game they are playing. Every country including the US wants to export its way out of this mess. It's mathematically impossible. It's also mathematically impossible for Europe to grow its way out of its problem with the tactics taken by Trichet and the EU. It's mathematically impossible for the US to cut its budget deficit, be the world's policeman, and not reduce entitlement spending. It's impossible to grow our way out of pension problems. It's mathematically impossible for tariffs to solve our problems, yet Congress plays chicken with China on that score every month. Bernanke and Geithner have recently joined Congress in that game of chicken. I hope you now see how interrelated and complicated this mess is, complete with simultaneous central-bank competitive currency devaluation tactics in Japan, China, and the US, with no possible currency tactics in Ireland, Greece, Portugal, and Spain (countries that arguably need currency tactics)! From Bernanke to Trichet, to China, to Australia and Canada, to hedge funds and investors, to currency and carry-trade speculators, very few understand the inevitable end-result of chicken. We are in a currency endgame that no one on this planet can be sure how or when it ends, or who blows up first. I highly doubt the US is first, and certainly none of the above suggests US hyperinflation. Nonetheless, the order in which things blowup is very important, depending on which side of each trade you are on. If that was not bad enough, the odds of a multiple simultaneous crash (or rapid series of crashes) is high and growing as central bankers pull out ever-increasing, counter-productive, and clearly destabilizing bazooka-stops, hoping-against-hope to keep a lid on things. Is it any wonder the price of gold keeps soaring? In the meantime, various pressures mount. At some point the global pressure cooker will blow sky high. I suspect the Eurozone or Japan will be the first of the big boys, but any number of scenarios are possible. When this complicated mess does blowup (and it will), all the "sure thing" traders on the wrong side of a bet will realize too late, that they played one game of chicken too many.